Here’s another of the undated and unidentified location shots from the City’s Archives. From the cars we’re putting this into the 1970s; it’s at least 30 years ago as the Expo 86 pavilion now occupied (for only a short while longer) by the casino is just visible today. 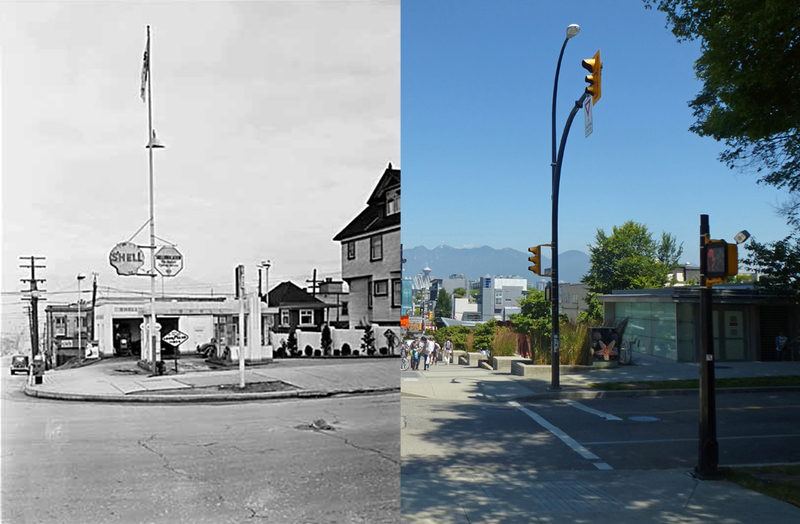 We’re looking north on Columbia Street towards False Creek and the mountains. Back then Downtown seemed a whole lot closer to the Mount Pleasant industrial area. You could see the Woodwards ‘W’, The Sun Tower, and the Dominion Building. Today there are two rows of buildings in the way; the residential towers built on the Expo lands, and the more recent buildings of South East False Creek. The industrial area hasn’t really changed that much – at least, not here. There are still a few of the houses that show how this area first developed, including one on the corner of 5th Avenue that dates back to 1909. It’s clearly visible in the 1970s, and hidden today by one of the street trees added in the past 40 years. It’s the 1890s. Mrs. H.E. Campbell in conversation with Major Matthews recalled the road from Eburne (Marpole today). “We went over to Vancouver once in a while, driving up Granville Street, as it is now called, but then it was just a slit in the forest, a solid wall of trees on both sides from Eburne to False Creek, with timber so tall you had to look straight up to see the sky. 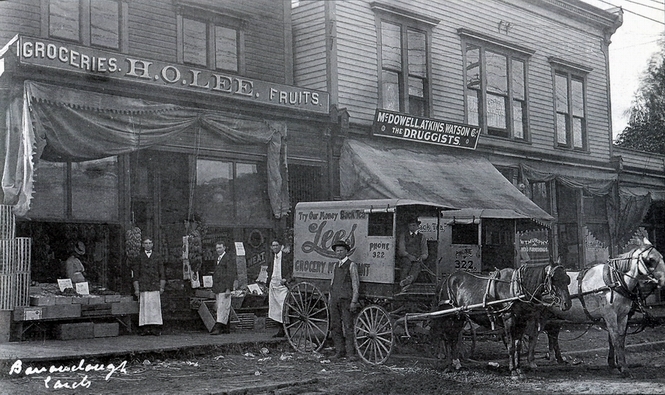 We went over to Vancouver on the first day of July 1890, and the mud on Granville Street was up to the hubs. The sun could not get in to dry the road—the trees were too tall. The road was no wider than a wagon, and, every half mile or so, there was a little space, somewhat wider, where the wagons could pass.” The bridge had been added in 1889, although there wasn’t a bridge over the Fraser River – just a rowboat ferry. Granville Street was called Centre Street initially, and 7th Avenue was the first east-west street to link Westminster (Main) and Centre (Granville). Ninth Avenue (Broadway) only became important when the carline was added. This stretch of Centre Street was widened and rolled in 1891, and to the south the forest started at 16th Avenue. At the bottom of the hill the bridge to the city started at Third Avenue. Beyond that was the creek; In the early 1900s Major Matthews recalled “False Creek was a haven for ducks in the winter time. There were literally hundreds, perhaps thousands of them; all kinds from butter balls to mallards and hell divers. They could, at times, be shot … They were poor eating, being too fishy.” The Major lived on the south shore, close to Ash Street. Today there are retail buildings (many of them art galleries), some with office space above, and down the hill the tower of the Portico development that replaced the Pacific Press plant.